At last, a final photo! (Have I mentioned how absolutely worth it those Marti Michell templates were?) Worked on as a side project while stumped on the quilt "Dragon's Fire." Expected to put it aside when I knew how to lay out "Dragon's Fire," but this quilt came together fast and was ready to go to the quilter's before I had my plan for Dragon's Fire ready to go. 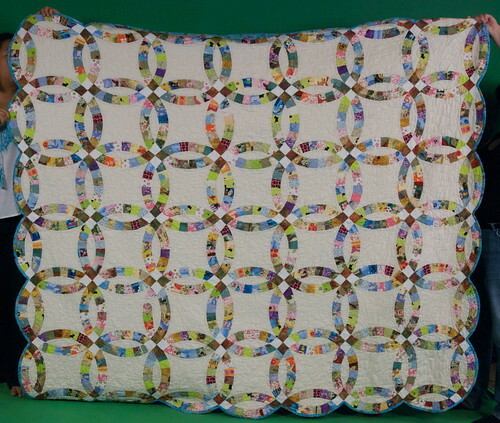 I just love your Double Wedding ring quilt! I've been dreaming of making my own for some time now. Good to know that Marti Michell's templates was a good investment.